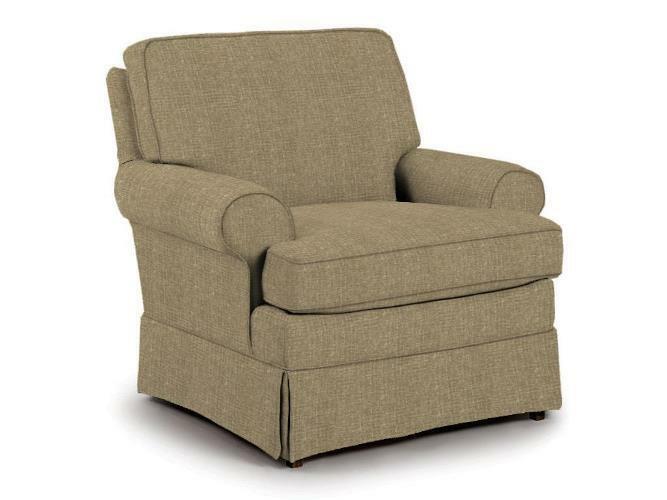 This Quinn Swivel Glide Chair is a great piece to accent your living room or den with. It features a simple rolled arm, t-shaped cushions and a kick pleat skirt. A comfort piece for relaxation that can swivel as well as glide, this chair fits well in living rooms and baby rooms as well as family entertainment spaces. The Swivel Glide Chairs Quinn Swivel Glider Chair by Best Home Furnishings at Miskelly Furniture in the Jackson, Pearl, Madison, Ridgeland, Flowood Mississippi area. Product availability may vary. Contact us for the most current availability on this product.